I wrote on 7 September 2008 that the litmus test for Mr. Zardari to prove whether he is an ‘don’ or an originator of a new dawn of democracy in Pakistan depends on his progress on 5 things: a) how he handles absolute power, b) his party, c) chief justice issue, d) charter of democracy and e) foreign policy. Looking at his performance in first 12 months, it is unfortunate that he is trailing on all. He could not father the nation and confined himself to the meager position of his party chairmanship and handles his party petty matters at President House, thus making it virtually impossible to look at PML with the same affection as required by the constitution bring his very office into a conflict & disrepute. He enjoys all the powers which ideally should have been assigned to his party premier, but he did not. Drone attacks and missiles in Fata are still falling randomly, a bitter reality, and he has not taken concrete steps to implement sacred historic charter duly signed by his wife in London on 14 May 2006 which has a hope for the nation in decades to come. He not only backed out on his promises, & written agreements on judiciary, but humiliated the chief justice and went one step ahead by appointing higher court judges on whole sale basis without consensus, and consultation with provincial Govt in question & his partners in COD, thus he violated the charter which can save the Federation and civil rule in the country. He gathered a team of non elected commodity around him and has cornered opposition. He has ordered Governor Rule and let loose his fiery aide in Punjab to blow fire on opposition leaders. First he lost credibility of his words, his faith in democracy and now his respect amongst his peers. PPP leadership has been enjoying the safe haven of UK and abroad to fight their corruption cases as well as advancing their activity of political and civil rights in Pakistan. Nawaz Sharif was in exile too. Both BB & Nawaz signed a social charter in the end realizing the best way out to bring Pakistan to a viable state of civil rule. PPP always advocated for true democracy in the country. However, once they are in power they are adopting the very unfair means against which political parties have been fighting for last 9 years. They are unwilling to give the opposition the same rights which they were demanding for almost the whole decade for themselves. Ignoring ‘Charter of Democracy’ will wipe out the spirit of reconciliation in Pakistan and will end normal political activity and era of 90’s will return by default. Politicians after seeing off 3 martial laws covering nearly four decades must learn a lesson from history and they must work jointly for rule of law, justice and democracy on the principle of live and let live in the country and initiate joint collaboration on ‘COD’ on emergency basis. If popular politicians are kept out of Parliament, then ultimately decisions will be made on streets which will be tragedy for the State which is in a volatile situation at the moment due to ongoing war on terror, bleak law and order situation where Sri Lankan team left during an unfinished test match and west is advising their citizens not to visit Pakistan, drone attacks laughing at the face of foreign policy, and country’s poverty ridden people with weaker institution(s). In this economic melt down a popular slogan of his govt ‘roti, kapra aur makan’ seems like a dream. A time frame is chalked out to implement the ‘Charter of Democracy’ in its letter and spirit.’ If COD is implemented, then tussle between two may not remain. If the rule of the game are respected, and referees are independent then civil system remains intact, otherwise long term military dictatorship, shorter civilian rule and accountability on the name of corruption will be the legacy these political rulers will leave behind for the generations to come. I have strong reservation on the role of West too. It is time that Western countries who are ready to broker deals in order to sponsor the imports of defunct leaders to Pakistan must take notice of barring opposition & the plight of deposed Chief Justice and the lawyers movement and they must impress upon Mr. Zardari to honour the pledges and give space to the opposition. If the West fails to make it clear strongly, we may miss the opportunity to have rule of law, justice and democracy in Pakistan for a long period to come which will destabilize the country & struggle for civil rights and will increase militancy and radicalization in the region. Looking at the performance of Mr. Zardari’s team when his legal eagles are vigorously defending his poorly managed decisions & ordinances, it reminds us the performance of Wasi Zafar, Qayum and Qasuri, in not too distant past, and their fate in the end too. His media team is doing a hard job too and similar to that when we saw Sheikh Rashid, Afghan and Durrani selling a wrong stuff to the nation on the issue of exiled leadership and chief justice. He has not even learnt from the counter protesting rallies of 12 May when his own party was a victim at the hands of violence, and of course, violence breeds intolerance in return. Musharraf could not win even by showing fists and gathering millions with horse dance at Islamabad, as public likes humility and Govts never stage protests and rallies for and against their own performances, its the prerogative of opposition. Political parties must realise that their workers are loose cannons and once they are out they are like swords drawn, and President Zardari is making life difficult for both major parties by remaining partisan and if they are confronted, it will wipe out ever a chance of having a healthy democracy in Pakistan. I am afraid Mr. Zardari could not get out of the shell and remained limited to the spouse status of the former Premier, Be Nazir Bhuttoo, a legendary, remarkable, charismatic leader full of intellect, and astute political sharpness. Alas, we could not see torch bearers of democracy acting as democrats in the end when time came, and Pakistan again stands alone calling out loud for help inviting to the elite, is there anyone who can save Pakistan by following the Quaid e Azam’s command of unity, faith and discipline. I am afraid rulers are on leave. •Terminate Rehaman Malik, for failing to provide adequate security to Srilankan cricket team. •Terminate Salman Tasir, for making unnecessary changes in the police and administrative department which lead to the security lapse. •Terminate the Sports Minister, for not ensuring that adequate security was provided to the Srilankan Cricket Team. But Zardari will do none of that, simply because he is Zardari and he will always remain Zardari. 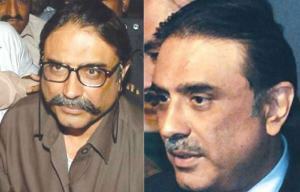 Mr. Zardai will remain Mr.Zardari, whether Pakistan remains are not! The person who becomes president in Pakistan, keep his mind outside presidency, because he fails to understand common things and feels himself God. let me start with the drone attack..they were part of the "with us or against us" deal on the War on Terror. we didn't have a choice then, we don't now. for anyone observing the media and frequenting the Foreign Office will see each briefing stating the same "drones are collateral damage"..even put into words that put the ball in the US court "it is inciting hatred for the US" but to no avail. tell me, can you really, truly tell a super power not to bomb you when you are at their mercy? and before you go and say we did it to ourselves, have a microscopic look at paksitan's history – financial and political, in that order and tell me if Pakistan ever had a choice. as for the CJ.. please.. i've just about had it with the the entire judicial crowd. law and policy makers around the world are the most literate and educated people in a civilzed society who go on to become politicians in most cases and run governments.. our lawyers can stop winning accolades around the world, jumping off of podiums and spray painting each other black.. some state interest that is!! thank god none of them is in the govt yet! as for his partners in COD one needs to meet across the board..give and take. not inflexible demands of do this and do that. not in a country where politics is beseiged by internal opportunists, leeches sucking their very own land and external termites and parasites, living off of our misery. if any of the above mentioned groups or individuals even had a shred of pakistan's interest at heart, we'd be a different picture altogether.